Be seen at the hottest new Resort and Casino in Las Vegas, at the best location on the strip! 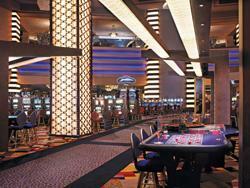 The Planet Hollywood Resort and Casino in Las Vegas is the place where everyone is a celebrity. Offering the glamour of Hollywood, guests are treated to the star treatment which ensures everyone feels both welcome and comfortable. Planet Hollywood Hotel Las Vegas is a place where you belong. Boasting three acres of gaming under one roof with your favorite table and slot games, the Planet's newly designed Casino features video and plasma, giving patrons a true "WoW" from the moment they step on the floor. This is complimented by over 75,000 sq ft of self contained meeting space on our Mezzanine level. The Entertainment at the Planet Hollywood Hotel is out of this world. Enjoy headlining performances at the 7,000-seat Theater for the Performing Arts which will feature "The Beauty of Magic" starring Hans Klok and Carmen Electra. "STOMP OUT LOUD", from the producers of "STOMP" will be the main act in our newly designed 1,500-seat Showroom. Pay a visit to the center bar Heart and sip on signature martinis or join sports fans and exchange high-fives in the Extra bar. When it comes to dining, something for everyone at the Planet Hollywood Hotel is offered. Planet Dailies is an eclectic cafe open 24 hours a day. Upscale Chinese is a favorite at P.F. Chang's, and for world-class cuisine and desserts galore, visit the #1 rated Spice Market Buffet. Coming soon, guests will have choices ranging from traditional steaks at Strip House to unique Mexican food at Yolo's and authentic Italian at Alfredo's. In addition, the hotel will feature the renowned Japanese dining experience of Koi. The Earl of Sandwich will serve an extensive menu of gourmet meats and cheeses. At the Planet Hollywood Hotel guests can relax at the Spa by Mandara, give your skin and everything inside it the Hollywood treatment complete with massages, facials, hair and nail treatments, tanning and more. Relax and pamper yourself the Hollywood way. If one pool overlooking The Las Vegas Strip is good, then two pools, two hot tubs, and a seasonal poolside cafe must be even better. The Chapel at Planet Hollywood is the perfect romantic spot to tie the knot. For shopping, step into high style at the Miracle Mile Shops, where 170 of the most exclusive and unique merchants and 15 restaurants are too tempting to pass up. With our partner rates, you can save up to 50% off retail rates for Planet Hollywood! Complete the form below and we'll send you a free Planet Hollywood quote on your next trip to Las Vegas - no golf required!